The original classic K'NEX 8ft roller coaster used track made from orange split tubing, as shown in the photo opposite. 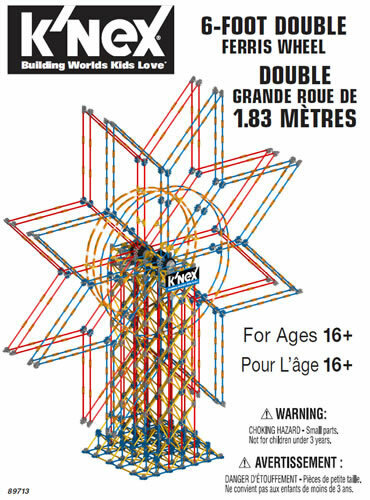 The tubing is the correct diameter to fit inside the rim of the 90979 Hub/pulley medium, allowing the roller coaster car to be constructed from classic K'NEX. Click here to download the Instruction book for this classic roller coaster (.PDF file 6.6Mb). The orange tubing is best attached to K'NEX models via the "Connector 5-way for Track Orange" (90910) and/or the "Clip with Splice end Orange" (90911) shown in the photo opposite. If possible, all 5-way connectors for Track should to be attached to orange 128mm rods (90958), as shown in the top photo. Orange rods are designed to ensure that the orange connectors remain at the very end of the rod, even after repeated use, thereby ensuring that the track width does not vary. Note also that different lengths of track can be joined to each other by using the 20501 Track splice (not shown). 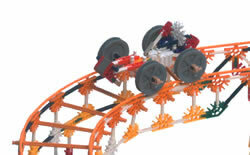 In addition to roller coasters, orange K'NEX track (92602) is excellent for creating K'NEX Ball coasters, in which a ball races down the track rather than a Coaster car. 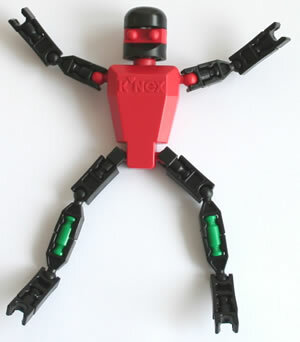 The most popular ball used for this purpose is the ball shown in the photo opposite, which can be built from any two of the K'NEX Ball half Red (90990), the K'NEX Ball half Yellow (90991) or the K'NEX Ball half Grey (90967). The completed ball is approx 46mm in diameter, and it has a hole through it, which fits any classic K'NEX rod. 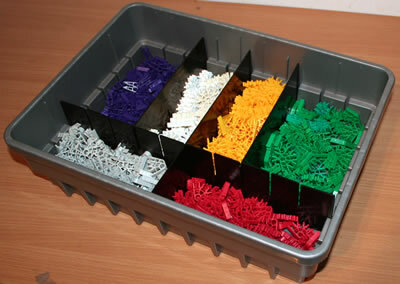 A well-known example of a ball coaster is the K'NEX Big Ball factory, shown opposite. Click here to download the Instruction book for the Big Ball Factory (.PDF file 6Mb).